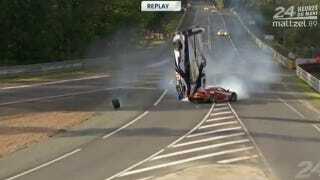 The massive crash seen here has so far been the biggest event of today's 80th running of the 24 hours of Le Mans. Right as the sixth hour of the race began Anthony Davidson, in the Number 8 Toyota TS 030 Hybrid, was overtaking the Number 81 AF Corse Ferrari GTE Am. The two cars collided as they cruised into the Mulsanne Corner sending Davidson's Toyota Hybrid flying through the air and flipping over the Ferrari driven by Piergiuseppe Perazzini. Despite the high speeds of the two cars when they crashed, both drivers appear to have escaped serious injury. They both climbed out of their cars on their own and are currently being evaluated.